Had the politicians wanted Lehman saved, would the Fed have refused because of a legalism? Though Ben Bernanke wishes otherwise, his historical reputation won’t rest only on his efforts to save the financial system, but on his contribution to the meltdown in the first place by letting Lehman fail. In a mute Freudianism, he calls his new memoir “The Courage to Act” but settles on legal pettifogging (we didn’t have authority!) to explain his failure to act in Lehman’s case. Just to rehash our own position on all this, six months earlier we had congratulated Mr. Bernanke on the Bear Stearns rescue, saying that, with luck, he had put a floor under the dangerously illiquid mortgage assets that were junking up bank balance sheets. A second column, under the headline “More Bailouts, Please!,” suggested that the moral hazard attendant on the Bear rescue was preferable to the Fed’s habit of stoking economywide credit booms to keep the financial system afloat. So when Lehman weekend rolled around in September 2008 and it wasn’t clear yet that even AIG would be saved, we were flummoxed. “Fed intervention seemed a no-brainer, given the assumptions and priorities that have driven such decisions in the past,” we wrote, and could only conclude that the Fed dithered because it feared exhausting the resources and political capital it might need to meet larger bailout demands down the road. Let’s try a thought experiment: Suppose President Bush, Candidate Obama, Nancy Pelosi and Harry Reid had all taken to their respective soapboxes and demanded that the Fed stop a Lehman crash. 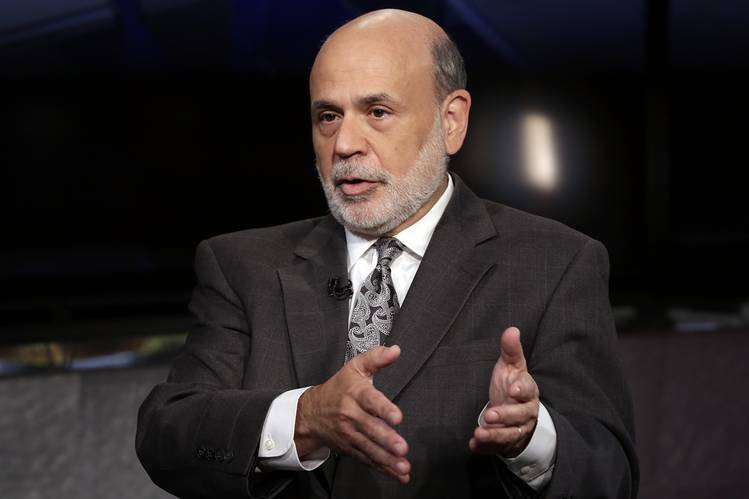 Would Mr. Bernanke have failed to bail out Lehman over a legalism? Of course not. Maybe he and Hank Paulson were right: The highly political moment would have produced a populist backlash that would have inhibited their future rescue efforts. In his book, though, Mr. Bernanke resorts to talking pointism. He seizes upon the fact that, in Lehman’s subsequent bankruptcy, creditors took sizable losses, so the Fed would have had to court losses it supposedly was legally prohibited from courting. First, it doesn’t follow that the Fed would have taken losses. Lehman, after all, was liquidated in a world in which Lehman had been allowed to fail. Second, who cares? The Fed can print money. Less spin would be useful right now for one important reason: Politicians and the public still haven’t grown up about the too-big-to-fail problem. Mr. Bernanke says CEOs and shareholders won’t be eager to repeat the experience of Bear Stearns, Lehman, etc. If only it were so. Creditors were largely bailed out. That means, in the quest for competitive returns, shareholders and CEOs in the future inevitably will be led to press the limits on leverage because lenders believe them implicitly government-backed. Mr. Bernanke is correct when he says the Lehman panic, not the relatively modest losses on subprime mortgages, caused the global crash. But let’s spell it out. Since the Great Depression, largely due to the scholarship of people like Mr. Bernanke, investors and savers were conditioned to believe the U.S. government would not let the failure of a mere financial institution crater the world economy. Now their confidence in the safety net was mortally shaken. To paraphrase Mr. Bernanke paraphrasing this column, the time to worry about moral hazard is before a crisis, not in the middle of one. Posted on October 27, 2015, in Postings. Bookmark the permalink. 1 Comment. And there’s always the possibility that cronyism was a factor in selling assets at irrational levels to buddies, such as those of Schumer, during the fog of war, so that the smoke would help provide cover….